When I reviewed Sotto La Luna Gardenia, the first in the 'under the moon' series from Tauer Perfumes, I said that it wasn't meant to be a realistic gardenia soliflore, and of course, it didn't turn out to be one. The latest, Sotto La Luna Tuberose, invites you, in a similar fashion, to "revisit this white flower and rethink tuberose". To my nose, it comes closer to the soliflore concept — it is recognizably tuberose, pretty much from beginning to end — but it's hardly the sort of Ladies-Who-Lunch pretty white floral1 you might expect from a more conventional brand. Sotto La Luna Tuberose is rich and bold from the onset: a huge burst of spiced flower with mentholated accents and an overdose of green (the notes: cinnamon, cloves, galbanum, geranium, tuberose, ylang ylang, rose, jasmine, tuberose, patchouli and ambergris). As I said above, it smells to me like tuberose right away, and it goes on smelling like tuberose straight through, and more so than usual, a blow-by-blow of the proceedings seems pointless. The menthol accents do calm somewhat, and the spices eventually fade to a low buzz, but still, it's tuberose, and while the other notes might peek through from time to time if you go searching, to my mind they are supporting players. Not once did I smell it and think ah, there's the rose, or there's the patchouli, or whatever. I just thought: tuberose. 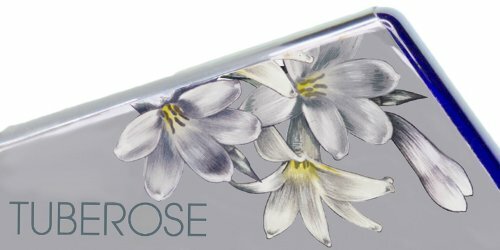 More to the point, perhaps, Andy Tauer's notion of tuberose: it is different enough from most tuberose perfumes that it is hard to think of it in the same category, and while I do not think it will be universally loved, certainly I would not avoid it because you don't usually care for tuberose, or white florals in general. A few comparisons, in case they help anybody: the top notes have something in common with the opening of Serge Lutens Tubéreuse Criminelle, but Sotto La Luna Tuberose does not share that one's cold, silky-smooth character. It isn't even slightly the lush hothouse flower of Frédéric Malle Carnal Flower (or Carnal Flower's forebear, Robert Piguet Fracas). It's even farther away from By Kilian's sterile beauty (with apologies to any fans), Beyond Love. In spirit, the closest I can think of is something like L'Artisan Parfumeur Nuit de Tubéreuse, or maybe Aftelier Cepes & Tuberose — other fragrances that have taken an unconventional approach to the subject of tuberose. Verdict: Love. In keeping with the series' conceit of a nocturnal flower, it's a little offbeat, but it's not at all hard to wear. Tuberose fragrances are often described as 'narcotic' for no discernible reason except that they're loud; this one has enough of a mysterious character that it could qualify. I walked around for days with my arm glued to my nose, anyway. I would not order it unsniffed. If you are looking for a more conventional, but still fantastic, tuberose, and you don't like any of those listed above, do try Hiram Green Moon Bloom. 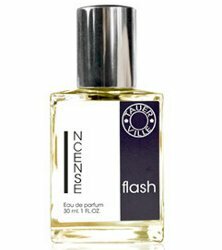 If you were wondering what the latest from Tauerville, Incense Flash, had in common with earlier iterations of incense from Tauer (namely, Incense extrême and Incense rosé) the answer, besides the obvious, is firstly about style. Like the prior scents, Incense Flash takes a naturalistic / unpolished / rugged approach to incense: I classified it right away as an outdoors, woodsmoke sort of incense. As such it's mostly dry, a little herbal, and entirely un-churchy. Secondly, leather!2 There is plenty of incense, but likewise plenty of leather, all over a woody amber-y base. It could be the cold weather version of Incense extrême, with nods to Lonestar Memories and L'air du Désert Marocain. Highly recommended, and hey, the price is not bad at all. Tauer Perfumes Sotto La Luna Tuberose is $145 for 50 ml Eau de Parfum. Tauerville Incense Flash is $63 for 30 ml Eau de Parfum. For buying information, see the listing for Tauer Perfumes under Perfume Houses. 1. Ladies Who Lunch was Angie's description of Estée Lauder Private Collection Tuberose Gardenia, taken from her review of Histoires de Parfums Tubéreuse 3 L'Animale. 2. Oops. Adding later that leather, obviously, is exactly what Incense Flash does NOT have in common with the earlier incense fragrances. I’m a tuberose-fiend so I am curious to try this. Can you say if this has that usual “Tauer-ade?” Because that Tauer-ade base, unfortunately, does not agree with me. I would not swear either way, but I do not notice it in the Tuberose. I think you might want to stay away from the Incense Flash. Agree so thoroughly about Incense Flash–woodsy not churchy, clear nods to L’Addm and Lonestar, and super price! If I had more perfume bucks to burn, I’d be very tempted, but I’m still working from samples of L’Addm, so an eventual bottle of that prob outranks Incense Flash on my personal shopping list. I never buy anything (ha, I like saying that! after all these years…) or I’d be tempted too, by both of these. I guess the 10 ml Flash size is no longer being made except as a gift-with-purchase? I’m still interested to try this. 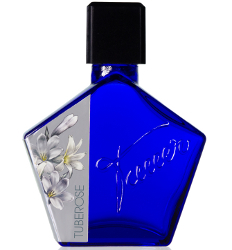 Love tuberose – and it wasn’t the menthol in Tubby Criminal that did me in, it was the raw-meat thing. Didn’t like SLL Gardenia, though. The descriptions I’ve read of the Tuberose one don’t sound much like SLLG (which was so, well… thick and opaque and weird and almost not floral), so I think I really must order a sample. It is really nothing like the Gardenia, to me. Unfortunately for me, I had cleaned out the refrigerator the week I tried TC, and found two raw chicken breasts that I had set aside to “cook later,” then promptly forgot about. Ugh. That rotting raw meat element showed up in the first fifteen minutes of TC, and after it went away the rest of TC was lovely. I just couldn’t get over it. I like both Nuit de Tubereuse and Cepes & Tuberose, so I’ll try to sample the tuberose. I always wonder if it’s a difference in our noses or in our preferences, but I find BK Beyond Love summery and joyous. Fracas seems very cold to me. I think our preferences! But nobody will ever know for sure, I suppose. Anyway, this one is worth a shot. Oh My Robin! You’re really making me want to try the tuberose. I LOVE tubereuse criminelle and like Carnal Flower very much. I had to laugh (in agreement) when I read ‘sterile beauty’ re: Beyond Love (I usually refer to it as ‘tuberose without the magic’ but your description nails it. Of course apologies to fans :)). Oh and I love Cepes et Tuberose though I don’t get too much tuberose from it. Incense and Leather?! too many lemmings from your post, Robin! Ah, I think “tuberose without the magic” is an even better way to put it!